Featuring performance by: Animal Charm, Ann Hirsch, Beth Heinly, Bobby Gonzales, Cristine Brache, Bunny Rogers, Gabby Bess, Grace Miceli, and Matt Kalasky. 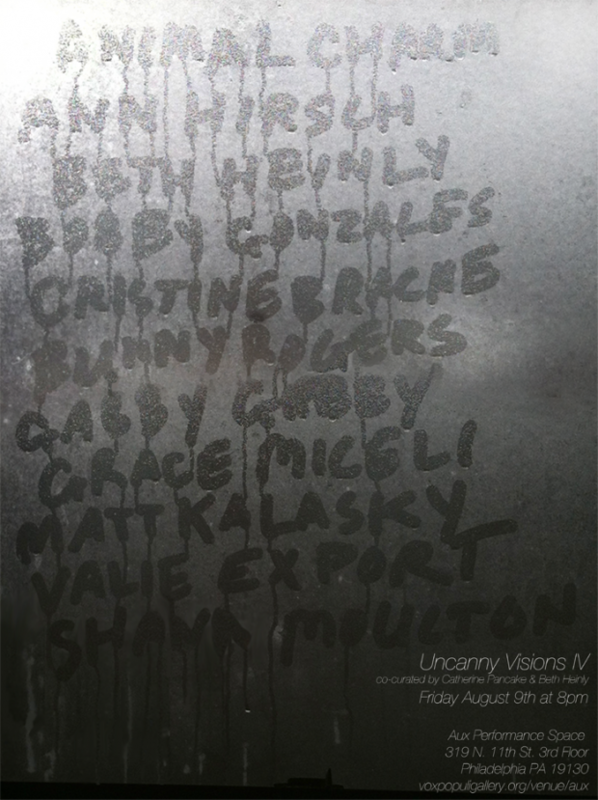 Uncanny Visions IV tackles that most persistent and elusive medium “poetry.” Specifically, we will feature a range of performance and video artists who function as self-styled “poets” in the most open mic sense of the word, but not. The stage will hold performance artists “performing” poetry as well as poets “performing art.” Our video offering offers up a slice of the same with artists seeking poetic escape, confession, and collage all of a certain “pathetic” direct address that we seek, absorb, and cannot wash off in the morning. Join us for a truly sweaty, sincere, smoozy, tearful, hilarious and fun “poetry-in.” Intriguing Vox member Beth Heinly serves as curator & ring-mistress for the night! This iteration of Uncanny visions combines the vision of two Vox members, with videos curated by Catherine Pancake and performances curated by Beth Heinly. Uncanny Visions is a series combining the lush private darkness of micro-cinema with the visceral charge of live cutting-edge performance art. The series takes inspiration from the concept of the uncanny, hoping to attract an audience who is drawn to the unfamiliar ready to take a few risks and participate in our communal unheimlich. Experimental cinema has a long historical engagement with the uncanny, crisscrossing psychoanalysis, altered states of mind, and visual illusion. Performance art’s obsession with the body and its extension through technology celebrates the flesh becoming art object and the anthropomorphism of the machine. Each Uncanny Vision event will join a program of experimental film with an original conceptual performance from national and internationally renowned artists.